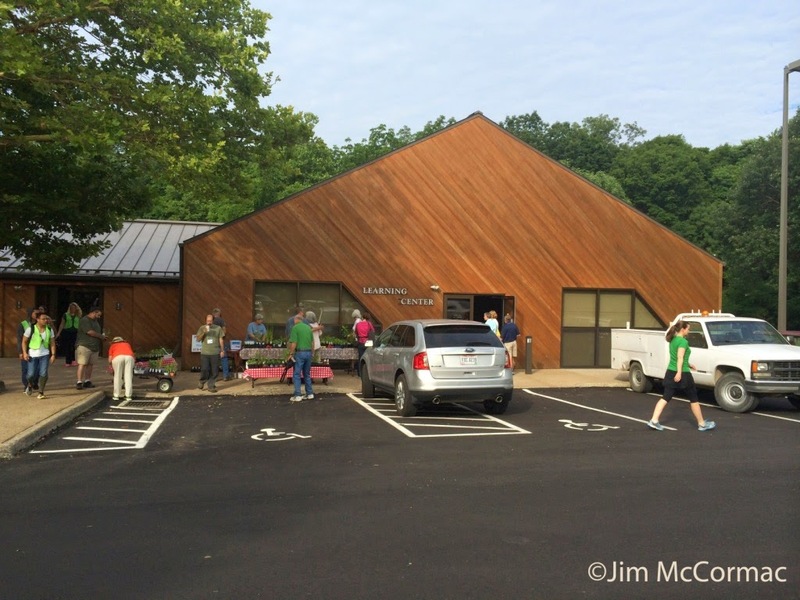 Yesterday, the Midwest Native Plant Society hosted a Butterfly Workshop in this building - the Caesar Creek Visitor Center, owned and managed by the U.S. Army Corps of Engineers. The facility is a fabulous venue for hosting such events, and is convenient to Cincinnati, Dayton, Columbus and lots of other places. We had about 105 attendees, mostly from Ohio, but also Indiana, Florida, and Kentucky. Major thanks go to the Army Corps for making the building available for such events, and to ranger Kim Baker for acting as our host. Linda Romine, also with the Corps, was also a great help. 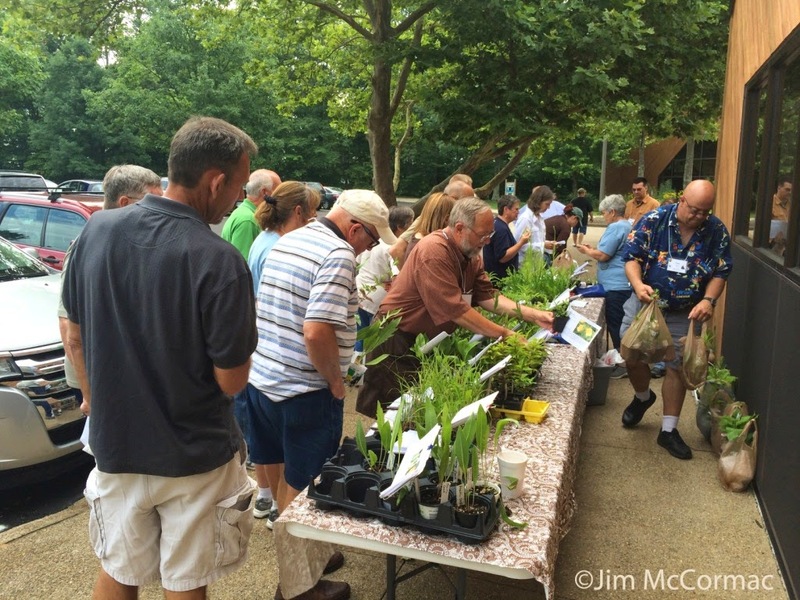 The Midwest Native Plant Society was formed to run our upcoming Midwest Native Plant Conference, now in its sixth year. We try to put on one or two other special events annually under the MNPS banner, and the Butterfly Workshop was one of those. Lunchtime at the workshop. We fairly well filled the place. 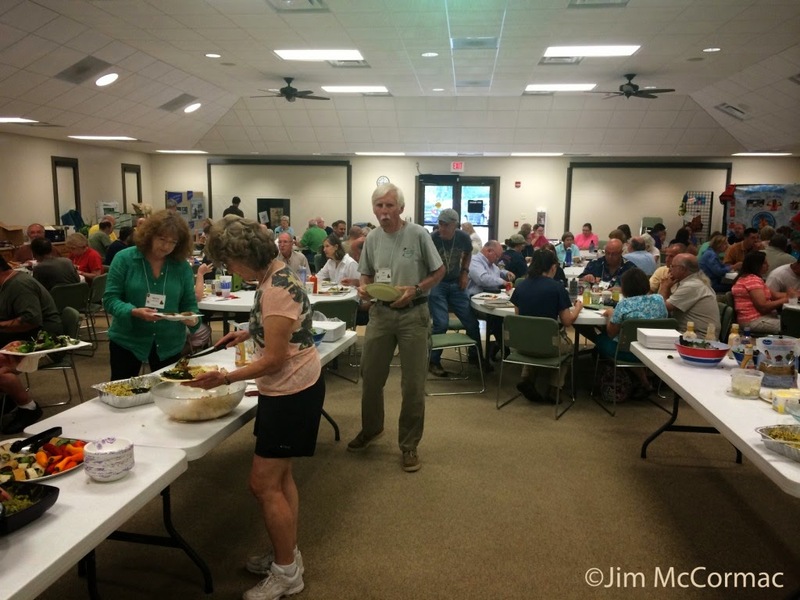 The Caesar Creek Visitor Center is perfect for hosting such events. This capacious conference room can be set up in a variety of different ways, and features a large drop-down screen and up-to-date audio-visual. At the other end of the building is a smaller auditorium, and that was perfect for use as a concurrent breakout session room. Major thanks go to everyone who made this event possible. Chief among them is Kathy McDonald, who oversaw all of the logistics in one form or another. Others who played key roles were Debi Wolterman, Yvonne Dunphey, Judy Ganance, and Sue Metheny. Jim Davidson, Sandy Belth and all of our speakers helped with leading field trips, and Mary Anne Barnett brought along a bunch of cool caterpillars for everyone to see. If I am forgetting anyone I apologize! 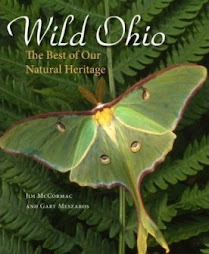 An event like this would be nothing without good presenters, and we had four topnotch ones: Jaret Daniels (author of Butterflies of Ohio), Jeff Belth (author of Butterflies of Indiana), Cheryl Harner, and Scott Hogsten. Thanks to all of them for informing and educating the group. One of our ulterior motives was to get more native plants in the hands of more people. 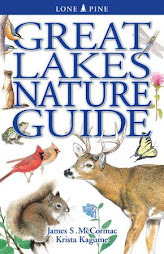 As you know (or should know), our butterflies, moths, and nearly all native insects and other animals require native plants. Helping us achieve this goal was Gale Martin of Natives in Harmony nursery. She sold a ton of good plants to people, including a boatload of milkweeds (go Monarchs!). 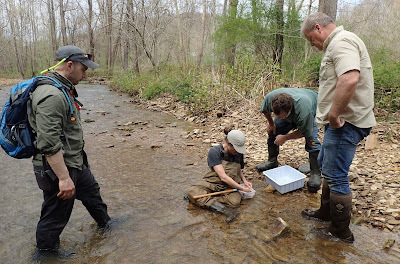 As is our habit, the conference included field trips. We believe that it is quite important to get people outside, even though doing so often adds huge logistical headaches to a conference. A big advantage of using the Caesar Creek Visitor's Center was the abundance of diverse habitats within minutes of the building. Indeed, one of our trips explored the prairie plantings, woods, and wetland immediately adjacent to the building. 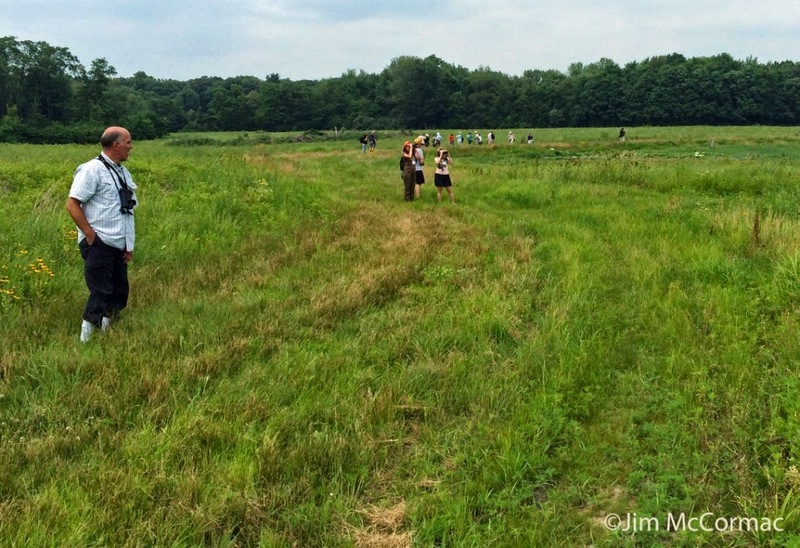 This group is wandering a large meadow full of native prairie plants, and dotted with two wetlands. Linda Romine and I led one group through here, and Jaret Daniels had another. Collectively, we found lots of cool stuff, and as is usually the case, the trips became natural history free-for-alls. We prioritized butterflies, but nothing was ignored. A definite highlight for many was an amazingly cooperative Yellow-breasted Chat that kept teeing up in plain sight and singing his odd series of hoots, squawks, grunts, and whistles. Chats can mimic well, and this one regularly performed a perfect rendition of the nearby Willow Flycatcher's soft whistled Whit! call notes. 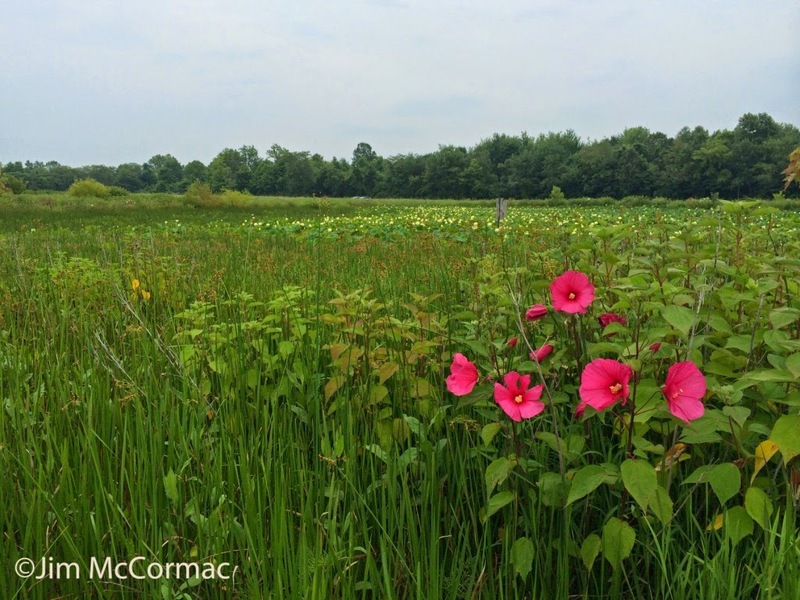 One of the wetlands was ringed by Swamp Rose Mallow, Hibiscus moscheutos, which was just coming into flower. Both carnation and white flower forms were present. Filling the interior of the wetland - the creamy specks in the backdrop - was flowering American Lotus, Nelumbo lutea. Nothing spikes diversity like a good wetland, and we found all sorts of interesting animals around and in these wetlands. The Corps of Engineers created these wetlands back in the 1990's, and have also planted lots of prairie species in the surrounding meadows. Today, we can enjoy the fruits of their labors, as this meadow is full of interesting animals. 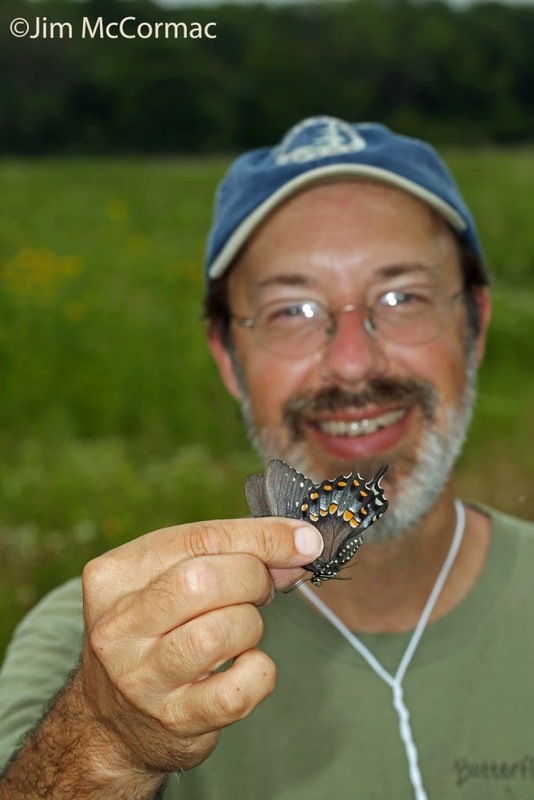 Jaret Daniels holds up a Spicebush Swallowtail, Papilio troilus, that he captured for the group to study. It was released unharmed, and was one of many in the meadow. Jaret is at the University of Florida, and Director of the Florida Museum of Natural History's McGuire Center for Lepidoptera & Biodiversity. 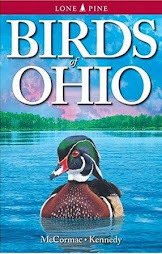 We're fortunate that he likes Ohio; he's been up here a number of times in the past decade to help out with events like this one, and share his vast knowledge. 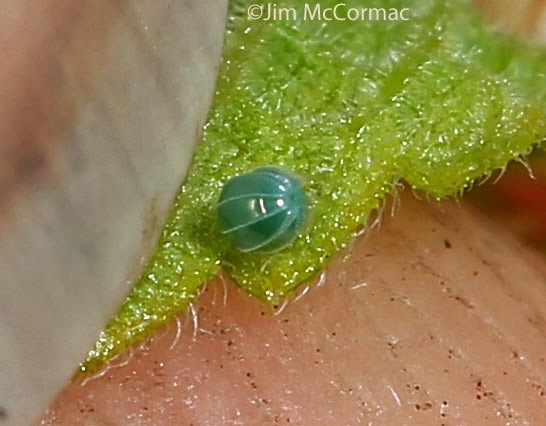 Jaret found this tiny Red Admiral, Vanessa atalanta, egg on a False Nettle, Boehmeria cylindrica, plant. It takes a sharp, trained eye to spot such minute objects. The egg taxed the limits of my 100 mm macro lens, but we can see some of its ornate sculpturing. It looks like a bluish-green barrel with prominent ribs. Red Admiral butterflies, which are among our showiest species, depend on several species of nettles for their host plants, demonstrating that even maligned native plants are quite valuable to fauna that is much appreciated by humans. 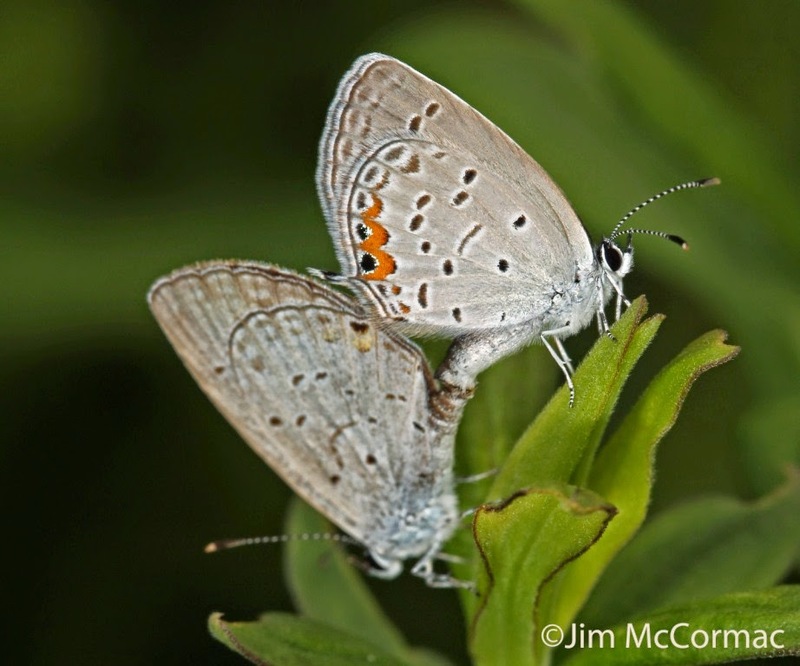 We encountered this cooperative pair of Eastern Tailed-Blues, Cupido comyntas. They were rather preoccupied with making more butterflies, which allowed our large group to closely admire them. The wetlands were awash with dragonflies of many species. Best was a brilliant male Comet Darner, Anax longipes, but he was not as cooperative as this comparatively tiny Azure Bluet, Enallagma aspersum. 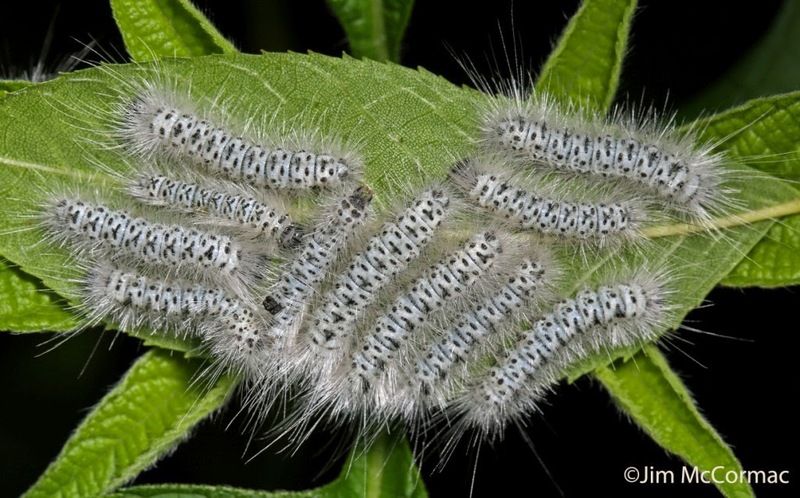 We ran across a pack of Hickory Tussock Moth caterpillars, Lophocampa caryae. working over a Black Walnut, Juglans nigra. These cats are quite showy upon close inspection. 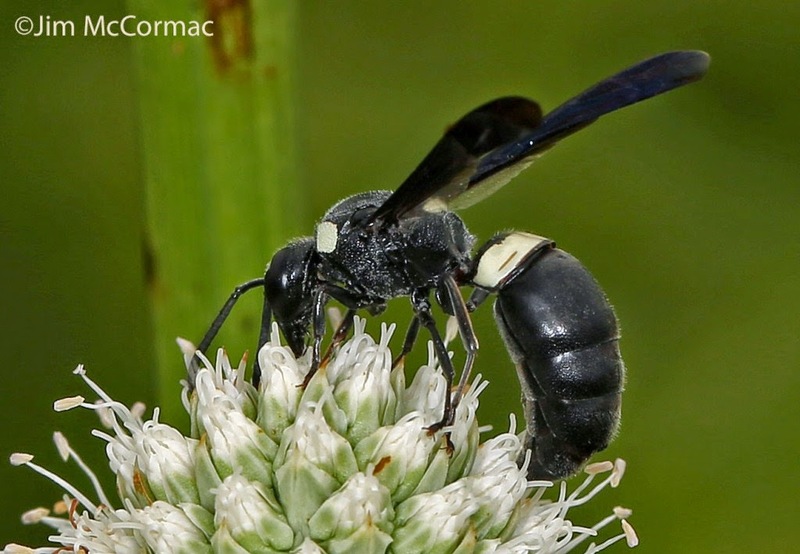 All of the native plants that filled the meadows provided a bounty of nectar for native pollinating insects such as this Potter Wasp, Monobia quadridens.Scores of native bees, flies, wasps, beetles, butterflies, moths and other insects were seen. This wasp is on the flowers of Rattlesnake-master, Eryngium yuccifolium, a native member of the parsley family and a plant that attracts scads of interesting pollinators. 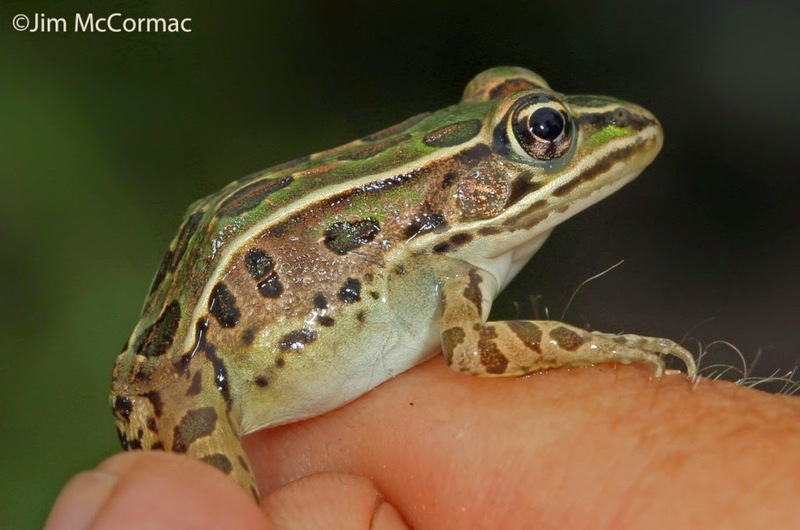 The wetlands produced a bumper crop of Northern Leopard Frogs, Lithobates pipiens, and Mike Zimmerman managed to snag one for the group's inspection. As I said, little escaped our notice or failed to capture our interest. Given the abundance of insect life in the meadows, I'm sure these frogs won't be lacking for food. Thanks to everyone who came out, and I'm sure we'll be doing more such events in the future. My husband and I attended this workshop and enjoyed it very much. It was a fun and educational day. Thanks so much for a great event!